The Journal of Psychoactive Drugs is now published by Taylor & Francis. If you are not automatically redirected to the new Journal website then click here. The editors of the Journal of Psychoactive Drugs welcome manuscripts of a multidisciplinary nature relevant to all aspects of psychoactive drug use and abuse. The Journal publishes a wide variety of articles, including critical and historical reviews, theoretical analyses, and speculative theses with a systematic focus, as well as reports on basic or applied research (on humans) of major significance. Because the Journal serves a readership of varied backgrounds, the editors must decline the consideration of papers that are overly technical or are solely intended for the professional colleagues of the author(s). Manuscripts should be legible and produced on one side of standard (81/2 x 11) paper. Three copies should be submitted. Authors should also keep a personal copy to check against proofs. All material (including references) must be double-spaced with ample margins (at least one inch on each side). In order to insure anonymity during the review process, a separate title page that includes the title, name of authors, and their affiliations should serve as the cover page. In addition, the following page should provide an abstract (maximum 200 words) that briefly describes the nature and content of the paper. There are no specific guidelines on the length of papers, but in general papers should not exceed 40 pages, including references, tables, and figures. References appearing in the text should conform to the author-date method of citation common in scientific texts and preferred by The Chicago Manual of Style. In the author-date method both elements of the citation are enclosed in parentheses: Table II describes the incidence of toxemia and low birth weight seen in heroin-addicted women (Connaughton 1974). It is not necessary to repeat the author�s name in the citation if it has just been mentioned. However, the date (enclosed in parentheses) should immediately follow the author�s name. In cases where multiple references are cited, include all references within parentheses in descending chronological order and separate them with a semicolon: (Davis 1975; Connaughton 1974). For works of multiple authorship, use the full form of citation for two or three authors: (Beachy, Petersen & Pearson 1979). In the text, the abbreviation �et al.� should be used for four or more authors: (Stone et al. 1971). A list of references, with complete publication data, in alphabetical order (and descending chronological order for identical authors of multiple citations) should be provided separately (also double-spaced) and placed immediately after the textual material. The standard bibliographic format for reference citations may be found below. Tables and Figures should be kept to an absolute minimum and should supplement rather than duplicate textual material. Each table should be provided on a separate sheet and placed after the references section of the manuscript. Figures should be submitted in camera-ready form. Photographs (black-and-white only) that are submitted as figures should be glossy prints, uncropped, and marked lightly on the back with a pencil. Proofs of each article, short communication, book review or letter to the editor will be sent to the lead author in typescript form following final acceptance and prior to publication. These are to be reviewed carefully and returned to the Journal�s office within seven days. Proofs that are not returned within this time limit will be considered approved. Authors are cautioned to compare all tabular material and quotes against their copy of the original manuscript. No page proofs are supplied. General Information: References should be listed in alphabetical order according to the first author�s surname. In the case of identical author(s), references should be listed in descending chronological order. Each citation should include all authors� names, date, title of article, journal title, volume and issue number, and page numbers, in that order. The title of the article should be punctuated in ordinary sentence style and followed by a period. The journal or book title should be in italics or underlined, indicating italics. Crisp, A.D. 1980. Making substance abuse prevention relevant to low-income Black neighborhoods. II. Research findings. Journal of Psychedelic Drugs 12 (2): 139-56. Spencer, P. & Schaumberg, H. 1975. Experimental neuropathy produced by 2,5-hexadione�a major metabolite of the neurotoxic industrial solvent methyl N-butyl ketone. Journal of Neurology, Neurosurgery and Psychiatry 38 (3): 771-75. Sells, S.B. ; Simpson, D.D. ; Joe, G.S. ; Demaree, R.G. ; Savage, L.N. & Lloyd, M.R. 1976. A national follow-up study to evaluate the effectiveness of drug abuse treatment: A report on Cohort 1 of the DARP five years later. American Journal of Drug and Alcohol Abuse 3 (4): 545-46. Weil, A.T. 1972. The Natural Mind: A New Way of Looking at Drugs and Higher Consciousness. Boston: Houghton Mifflin. Blum, K. (Ed.) 1977. Alcohol and Opiates: Neurochemical and Behavioral Mechanisms. New York: Academic Press. Milkman, H.B. & Shaffer, H.J. (Eds.) 1985. The Addictions: Multidisciplinary Perspectives and Treatments. Lexington, Massachusetts: Lexington Books. Savage, C. 1956. The LSD psychosis as a transaction between psychiatrist and patient. In: L. Cholden (Ed.) 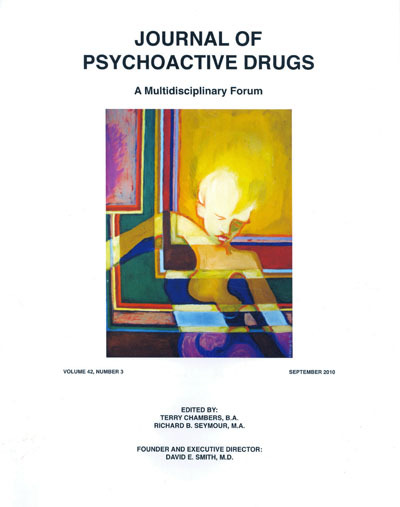 Proceedings of the Round Table on Lysergic Acid Diethylamide and Mescaline in Experimental Psychiatry. New York: Grune & Stratton. Copyright Journal of Psychoactive Drugs. All Rights Reserved.